The 83-year-old man had lost so much. His house had burned down in a terrible fire, leaving him homeless and without possessions. But the man hadn’t lost one very important thing to him — his tiny, blonde-furred cat. The fire had happened on Thursday. According to a news report, Ali Meşe, who lives in a small village in western Turkey, had been trying to light a gas stove inside his house. But something went wrong, and a small explosion occurred in his living room, causing a fire to sweep through his single-story wooden home. 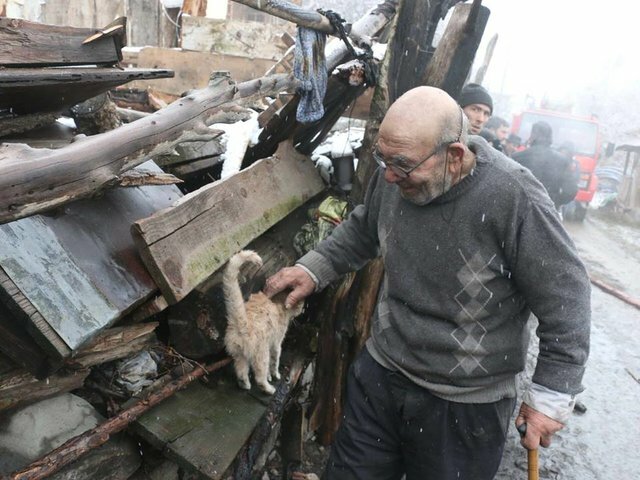 Neighbors immediately called the fire brigade, and rescue workers managed to save Meşe, as well as his wife, son and cat. But it was too late to save their house — it collapsed into itself, leaving a mess of wooden planks and metal roofing. 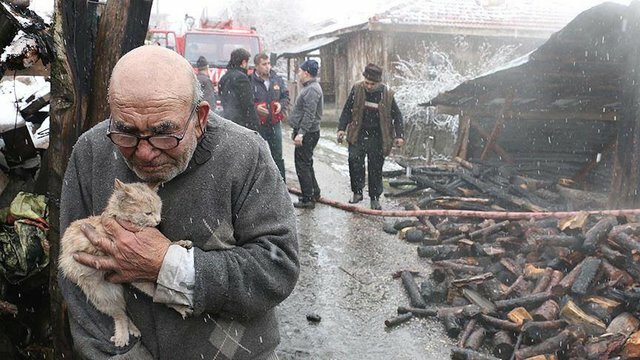 In an emotional photo, Meşe is pictured hugging his frightened cat as firefighters survey the damage. Meşe leans into his cane, while using his other hand to hold his cat against his chest. Neither of them look like they want to let go of each other. Meşe was injured in the fire — not majorly, but he had to go to the hospital. While he recovered, his story spread across Turkey. The Turkish Red Crescent — part of the International Red Cross — presented Meşe with gifts in the hospital. But the gifts weren’t exactly for Meşe — they were for his cat. 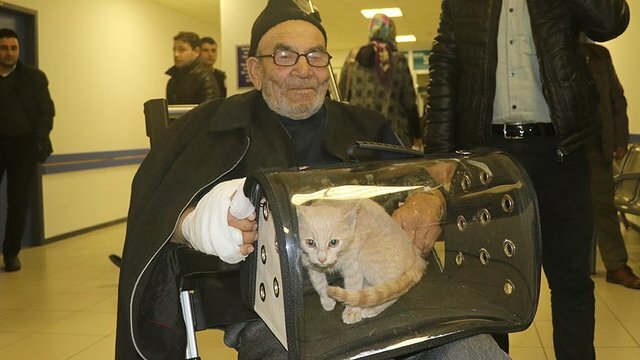 It wasn’t long before Meşe was reunited with his beloved cat — in fact, someone brought the little cat directly to the hospital. In another sweet photo, Meşe is shown to be hugging his cat again, but this time Meşe has a smile on his face.